Taking advantage of Flare’s capabilities for single-source publishing, eLearning Innovation can create content once in Flare, publish it to its content server, and link to it directly from an LMS, streamlining course production and maintenance. The single-sourcing features in Flare offer us tremendous flexibility. The fact that we can create different Flare targets to generate variations of the same content with different branding is a huge time-saver for us. We want to continue inspiring innovation… By ramping up our clients with Flare, we can improve our collaborative approach to course design. We want to grow our use of Flare both within our company and across our clients, taking the possibilities of eLearning to new heights. Since 2003, eLearning Innovation, has been providing instructional design services to higher education, K-12, corporate, government, and non-profit organizations. Specializing in experiential learning, eLearning Innovation creates active learning environments that inspire and educate. Today, leveraging Madcap Flare’s single-sourcing functionality, along with its own custom integration, eLearning Innovation delivers robust online courses directly to a Learning Management System (LMS). For many clients, course content is first developed in Microsoft® Word. To add the content to the LMS, the Word content has to be cut and pasted into an HTML editor in the LMS, a process that is both time-consuming and open to errors. "Whenever we build content in that method, it is trapped in the LMS. It is labor-intensive to maintain and make edits, since someone has to manually go into the LMS to make a change," remarked Laurie Pulido, eLearning Innovation founder and president. As the company has grown to develop hundreds of new courses, eLearning Innovation realized it needed a better solution. In April 2014, the company began searching for a product that would help streamline processes and advance its offerings. MadCap Flare emerged as the clear choice, providing a method for single-source publishing that would increase automation and scalability. 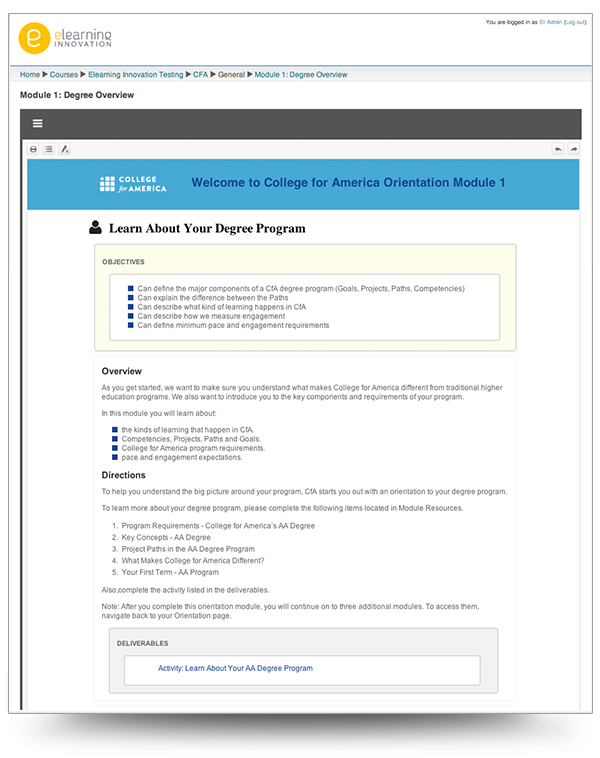 "MadCap software hit all of our points for a streamlined, cost-effective, and innovative solution," observed Eric Eberhardt, eLearning Innovation chief technology officer. Now, to quickly produce and update course content, eLearning Innovation takes advantage of MadCap Flare's native XML architecture and functionality for content reuse. eLearning Innovation uses snippets and variables to improve the consistency of course content and uses conditional tags to create variations for different audiences. eLearning Innovation (EI) develops content in Flare, using HTML5 templates that it has created and imported into Flare. EI then uses Flare to publish the content to EI’s content server in an eLearning ready format. Once the course content is published to EI’s content server, the course content is served directly from a link in the LMS using eLearning Innovation’s proprietary technology. The custom technology is based on the IMS Learning Tools Interoperability (LTI) specification, an integration standard for linking systems. From the learner’s perspective, he or she is simply clicking on a link within the course, and the content displays seamlessly in the LMS. Whenever there is a need to update the content, EI can update it in Flare and then republish it to the content server. “With Flare and our custom integration, we’ve eliminated the problem of having to go into the LMS to make a change,” remarks Pulido. 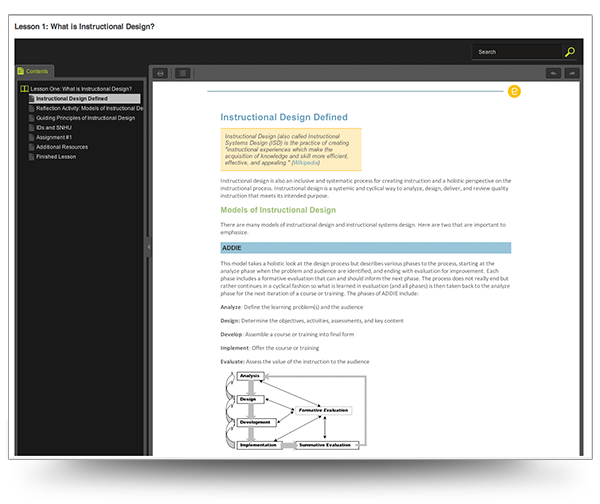 Internal Training Lesson: What is Instructional Design? eLearning Innovation’s technology also collects analytics as the learners interact with the content. eLearning Innovation is currently extending this capability to evaluate learners progress against course outcomes or competencies. “Our platform has a curriculum mapper, where learning outcomes can be associated with quizzes, surveys, and performance-based assessments. We are in the process of creating an embed standard to link learning outcomes with real-time analytics. For example, we will be able to add proprietary embed code into Flare content, that when viewed via our integration will display a quiz, a survey, or a performance-based assessment and its associated grading rubric. With these embed codes, we are adding the trigger to tell our proprietary platform to collect the analytics,” explains Mr. Eberhardt. Based on its own success using MadCap Flare, eLearning Innovation is now encouraging clients to adopt the software and its mode of development.